The Razor Rip Rider 360 is one of Razor’s more creative ride on toys. It won the a Parents Best Toys award for 2009 and is sure to be as popular an item this holiday season as it was for the last few. This information on prices, specs, and consumer reviews can help you decide if you want in on the action this Christmas. As soon as I saw the Rip Rider, I said “It’s a Big Wheel!”. I assure you – this is no Big Wheel (although I loved that when I was little). It’s better, faster, and sturdier. Kids LOVE it! It also lives up to its name – it spins, and spins, and spins. When my kids were younger, I planned several days each year where I would attempt to fight through the crowds at the mall, a couple of shopping lists stuffed in my purse, and a fistful of store ads in my hand. It didn’t take too many years like that – and the ever increasing ability to purchase online – before I could not stand it anymore. Almost 100% of my holiday shopping is done online. Whatever isn’t purchased online for the holidays is at least researched online. I researched the Razor Rip Rider 360 on a number of comparison sites. Knowing the price variances helps you determine whether or not you’re getting a good deal when you buy. If you’re a last minute shopper, you can be sure you’re chances of paying too much for popular items will go up the closer it gets to the holiday as you can end up scrambling to find the last one in your area. It also keeps you from buying the first one you see if you know you have more shopping time and are aware that lower prices are available at other locations or online. You would have to have been living under a rock not to have heard of Razor, the company that redesigned the kick scooter and went on to tackle a variety of ride on toys and skateboards for kids. Their products are famous for quality, design, strength, durability, and – always – a unique ability to give new life to old designs. The Rip Rider 360 is a three wheeled trike with dual inclined caster wheels that make for easy spins, drifting, and smooth gliding – all under the pedal power of its rider. We have a number of Razor ride-ons and scooters in our household and we’ve never been disappointed. All the same, I always like to thoroughly check out a new product with the information available online like customer reviews. I also comparison shop – especially over the holidays. Blue. That’s it. There’s only one color option available for the Razor Rip Rider 360 and no projections that they’ll be coming out with any new colors or exclusive releases before the holidays. Fortunately, it’s a nice shade. Rubber grip handles allow kids to maintain control of the three wheeled ride-on more easily. Less slippage. Low center of gravity and wide, rear profile helps prevent tipping. Pedal controls allow for breaking and accelerating as needed. Particularly for a new product, getting opinions from those who have purchased or tried the product can give you peace of mind before you make your own purchase. Some minor assembly required but was easy to put together. Sturdy and long-lasting, even when used heavily. Kids LOVE it – unanimous. Doesn’t seem to have flipped at all on a straight surface, but one child did flip it on a hill. Helmet is advised. Smooth handling and easy to pedal. There was one critical review because the package arrived without all of the necessary parts right before Christmas – order early to prevent any such crisis. 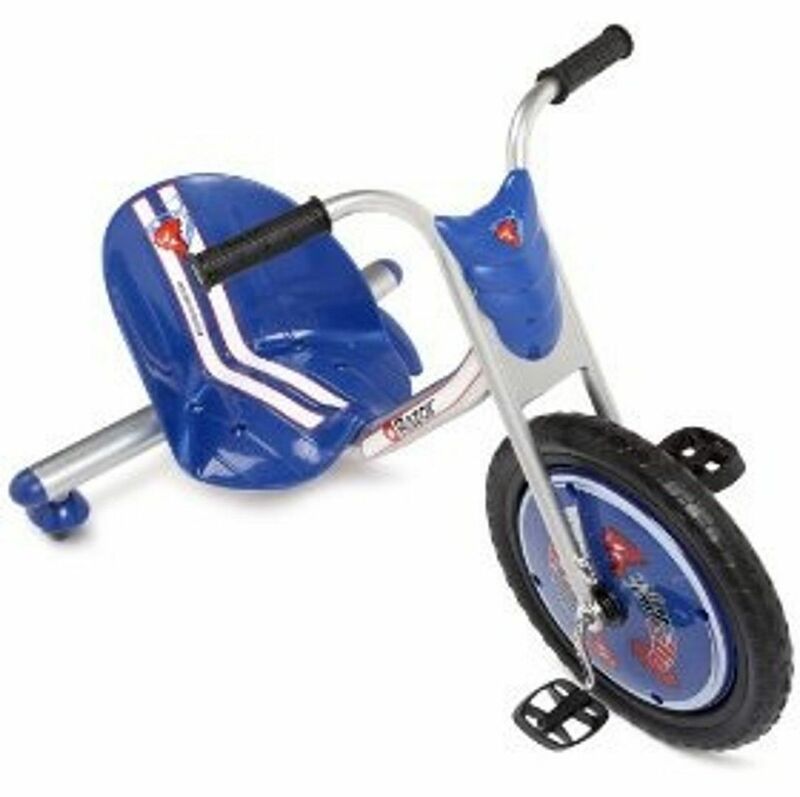 This is not a motorized kart like the Ground Force but provides a great physical exercise for children. Overall, the reviews were incredibly favorable with 94.7% of reviewers rating the Razor Rip Rider a 4 or better.